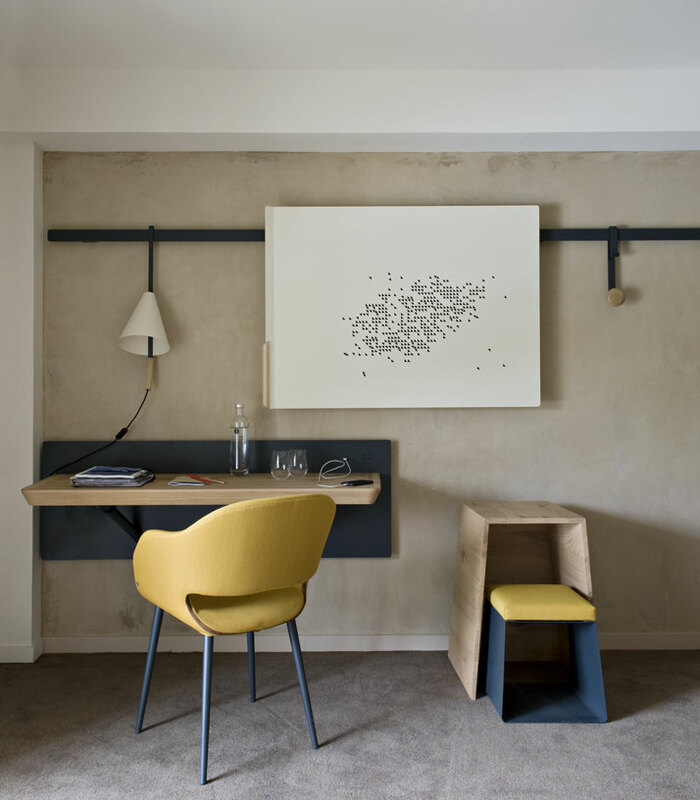 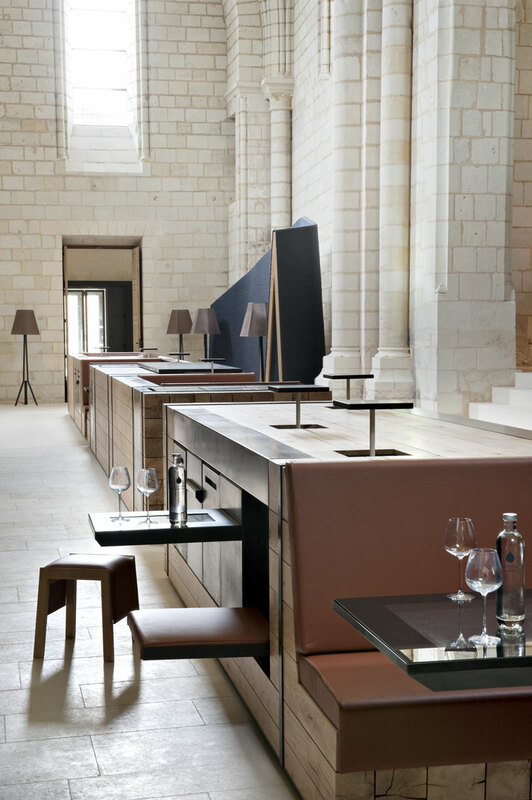 With hotel conversions in historic sites often ending up being rather soulless, the balance struck between modern-day tastes and needs, as well as history, is just right at the Fontevraud Abbey’s new hotel. 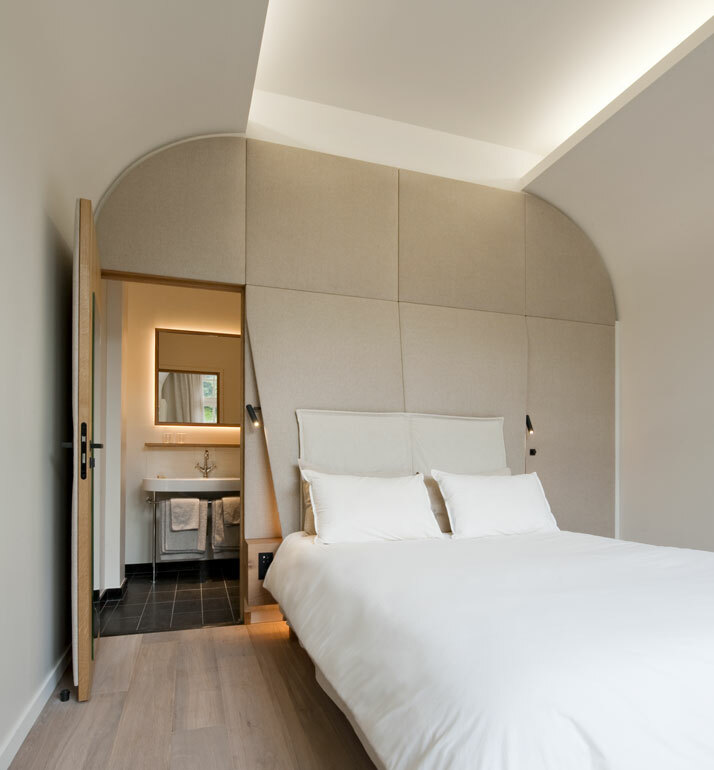 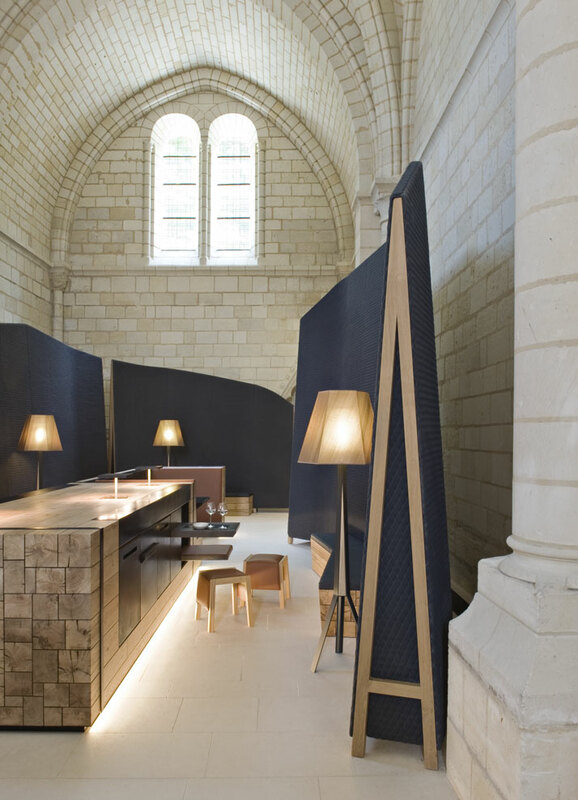 Designed by architect duo Jouin Manku, aka Patrick Jouin & Sanjit Manku, the soothing and sleek design leaves room for the historically charged interiors of one of the vastest monastic sites from the Middle Ages, to continue be the focal point of every space. 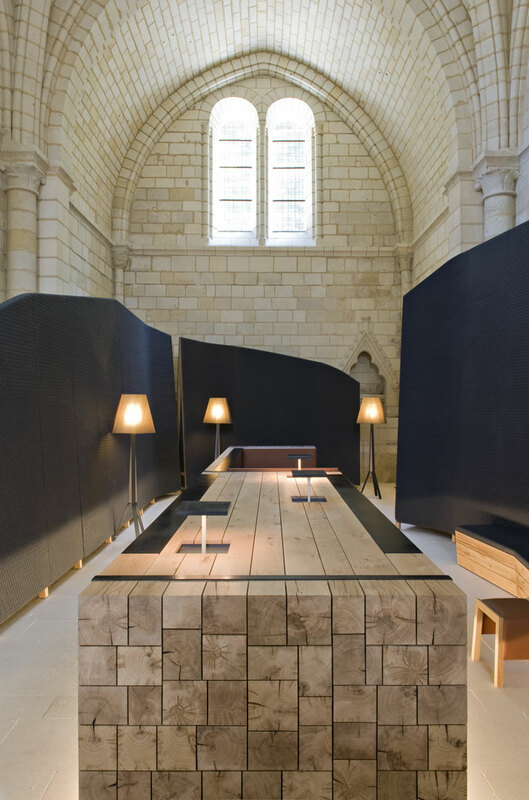 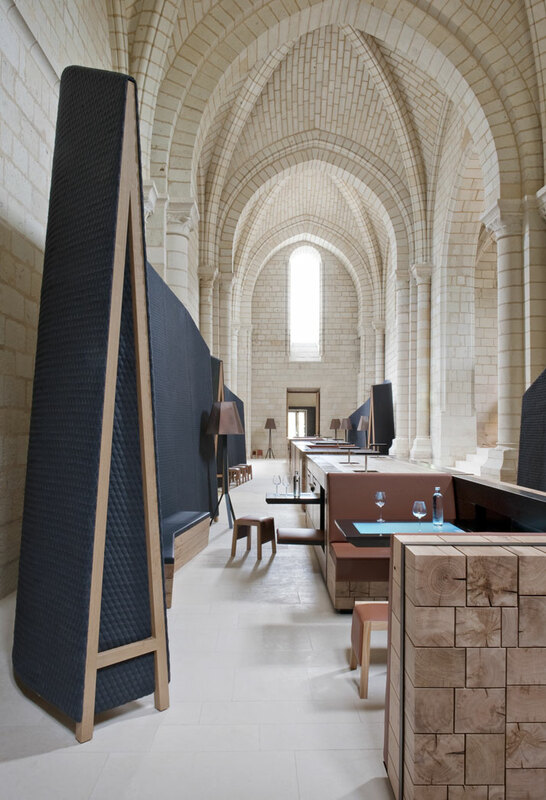 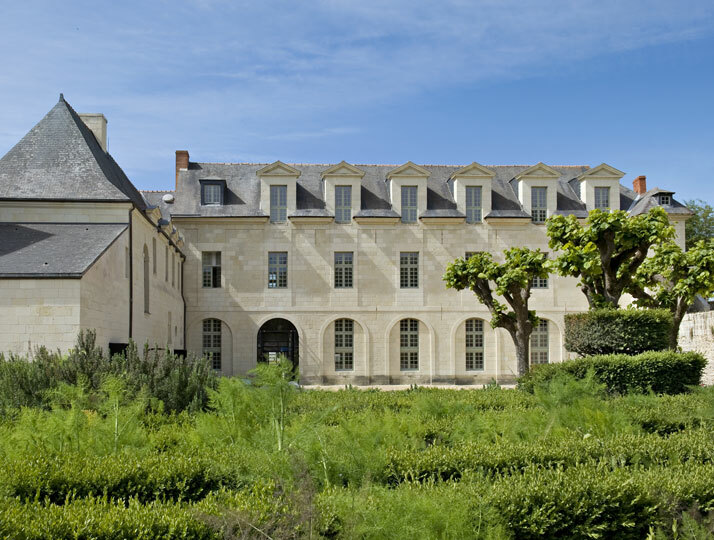 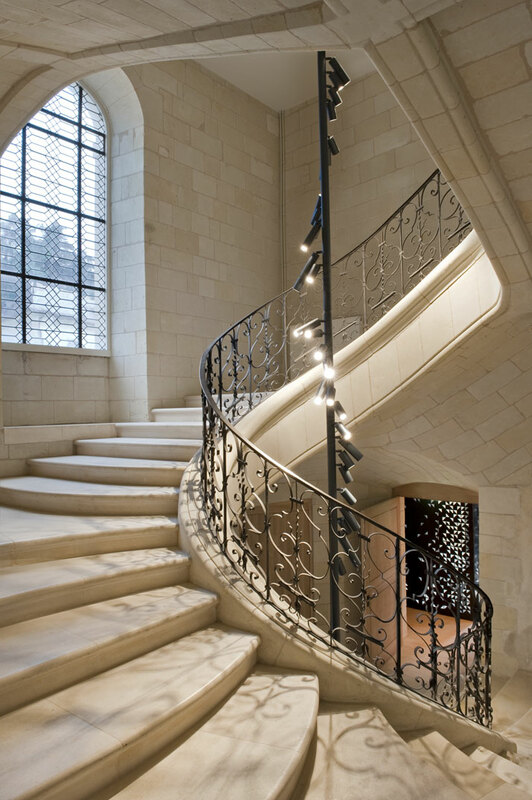 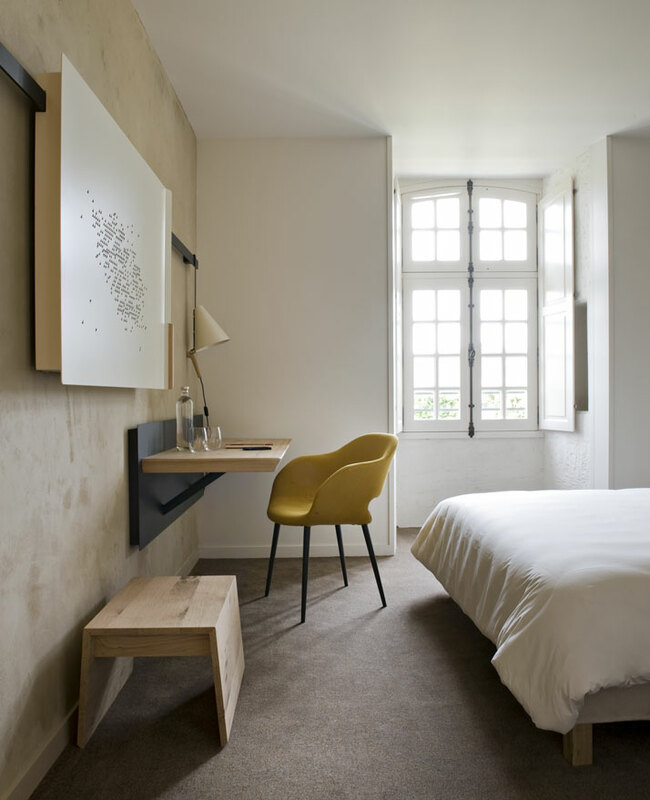 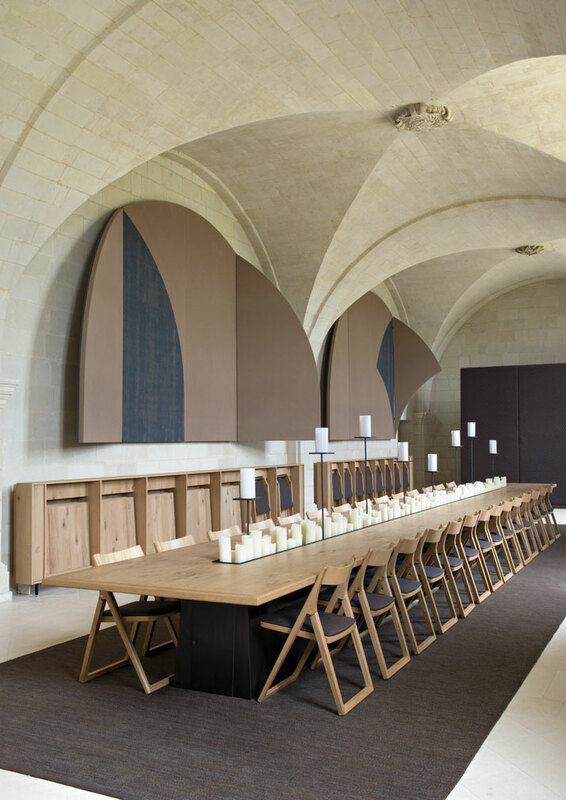 The four-star Hôtel Fontevraud replaces the previous three star hotel (which closed in 2012) situated inside the Abbaye de Fontevraud (founded in 1101 AD). 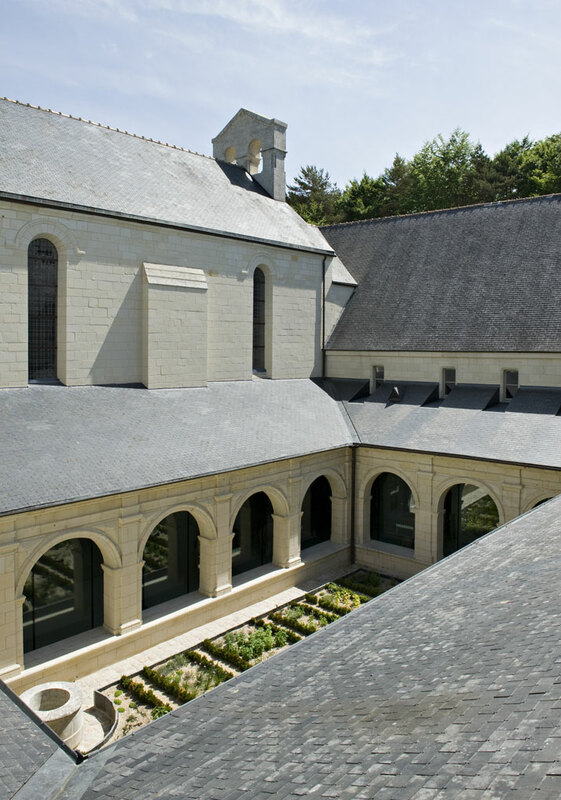 Located in Anjou, France, the UNESCO World Heritage Site was once the burial site of the English King Richard I or ‘Lion Heart’ as he came more famously to be known, which visitors can see today through his recumbent statue, as well as those of other Plantagenet family members, situated in the heart of the abbey. 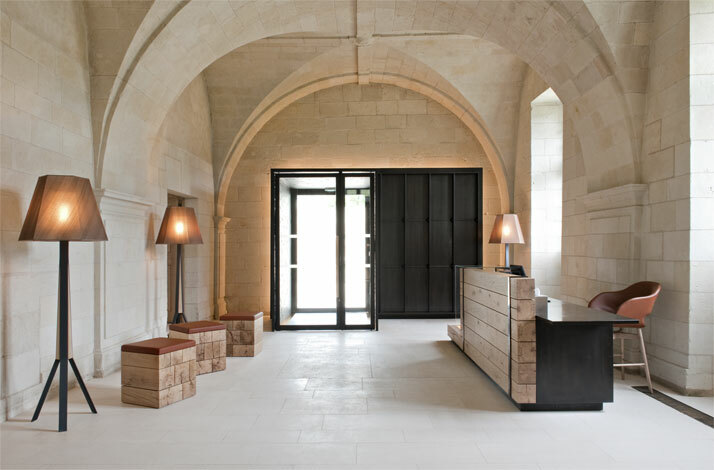 Located inside the Saint-Lazare priory, formerly one of the four abbey monasteries, the new hotel’s 52 guest rooms are split between the main building and the Liban (Lebanon) outhouse. 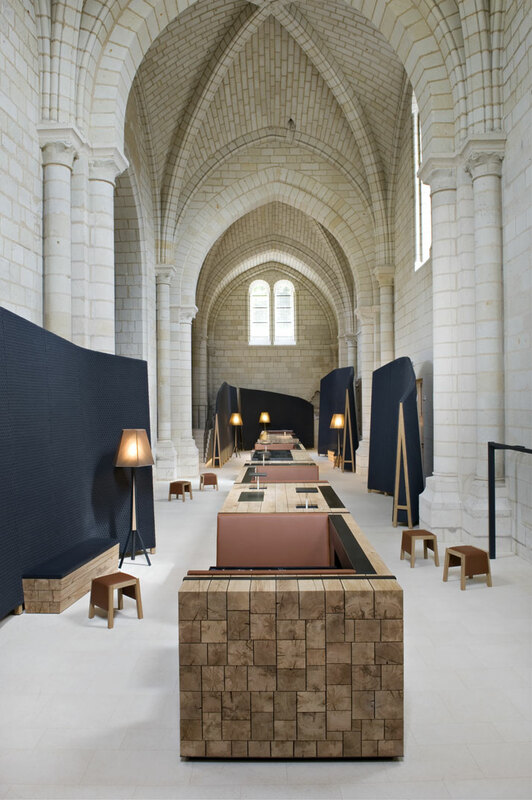 Whilst they vary in size and shape, elements of sharp design and a hushed atmosphere run throughout; with the tranquil atmosphere recalling the building’s time as a monastery. 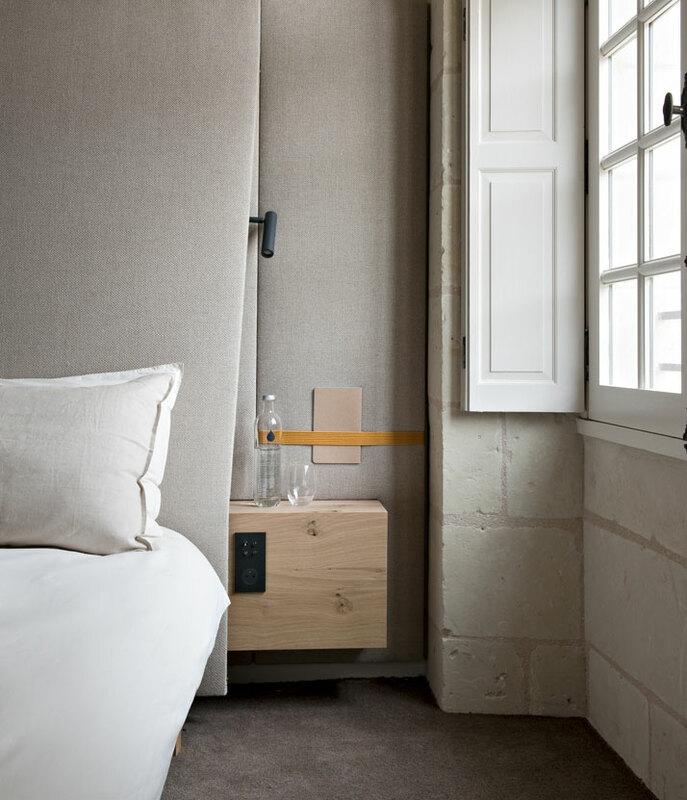 Reminders of these days also include the mobile lamps that hang on rails around the rooms, and the neutral colours used, right down to the brown of the towels recalling the fabric of a monk’s robe. 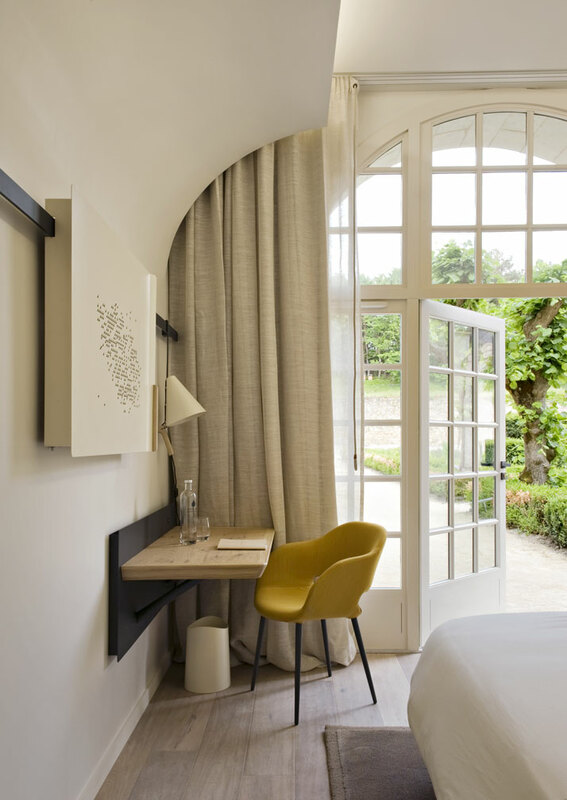 The rooms in the Liban building, including duplex family rooms on the first floor and double rooms with French windows that open onto the gardens on the ground floor, feature basic interiors with clean lines and neutral hues of earthy browns and greys with seldom dashes of colour like yellow, petrol blue, lime green, orange and turquoise. 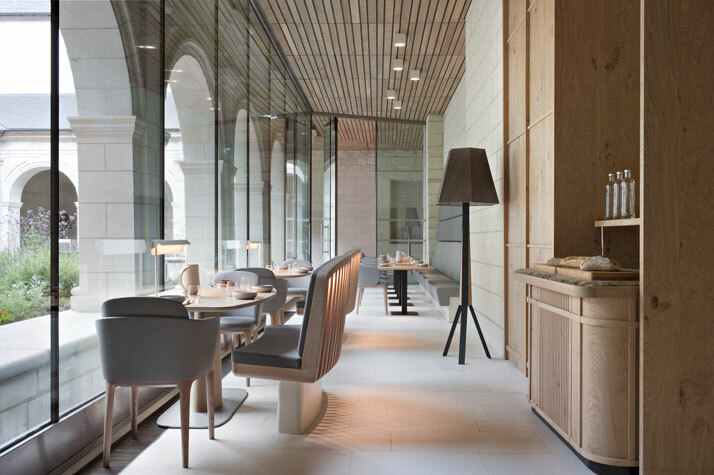 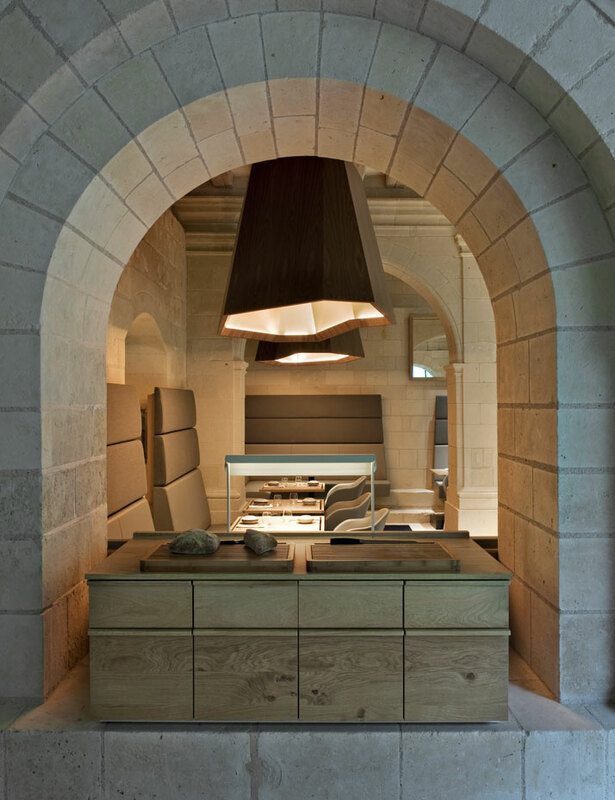 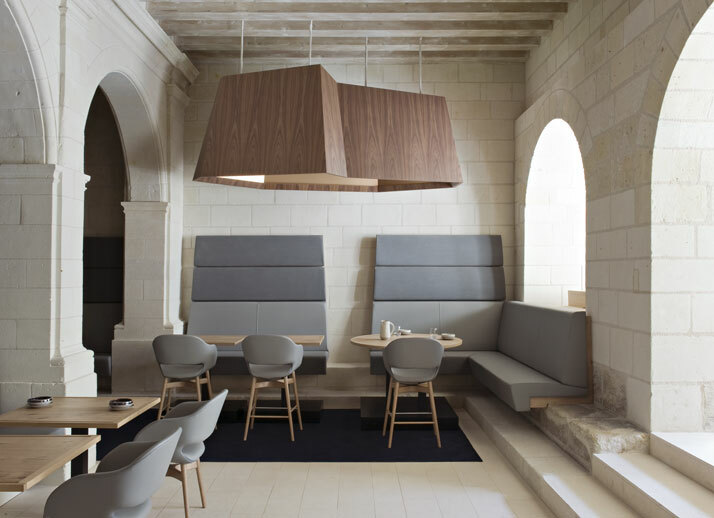 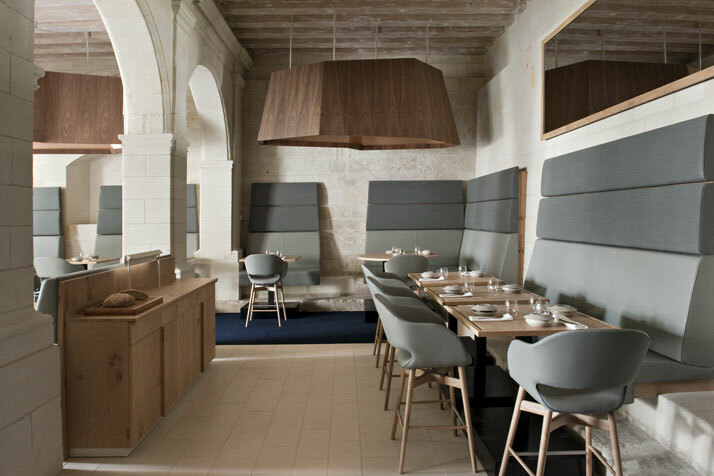 The same natural hues can be found in the Fontevraud restaurant. 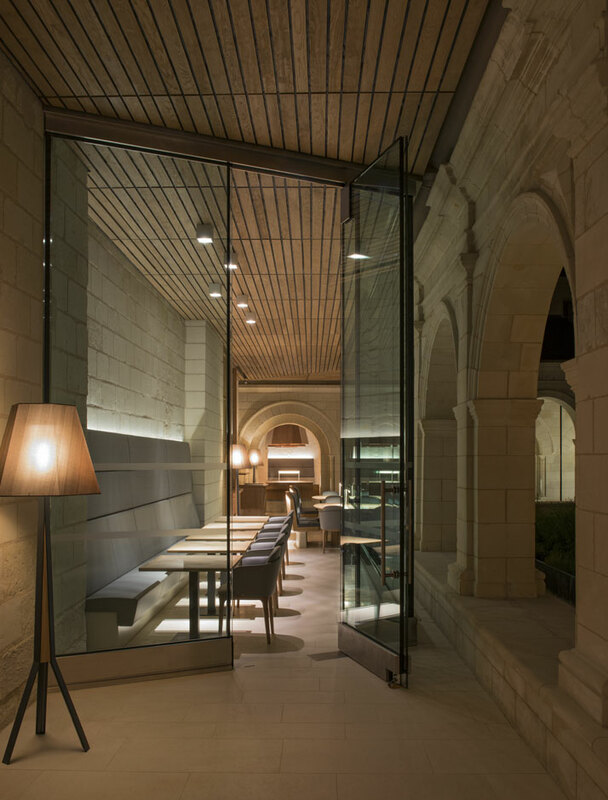 Wrapped in a window looking out onto the manicured garden of the Saint-Lazare monastery’s cloistered courtyard, the majestic banquet room, gourmet restaurant, manned by Bocuse d’Or winner Thibaut Ruggeri, and iBar, with its smooth straight lines and deep petrol blue fabric palisades, are all slick additions to the hotel. 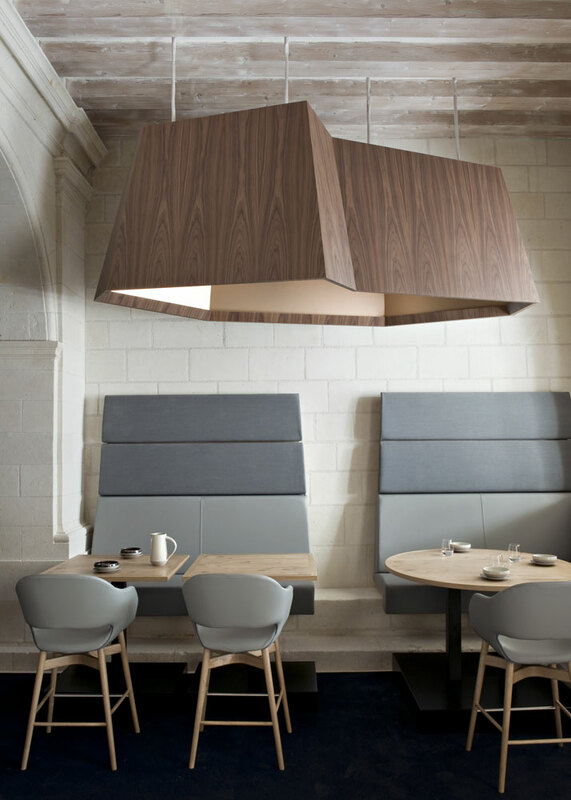 In the lofty restaurant, exposed brick walls are juxtaposed against light grey seating whilst over-sized wood and copper lined clouds of light hang above each cluster of tables. 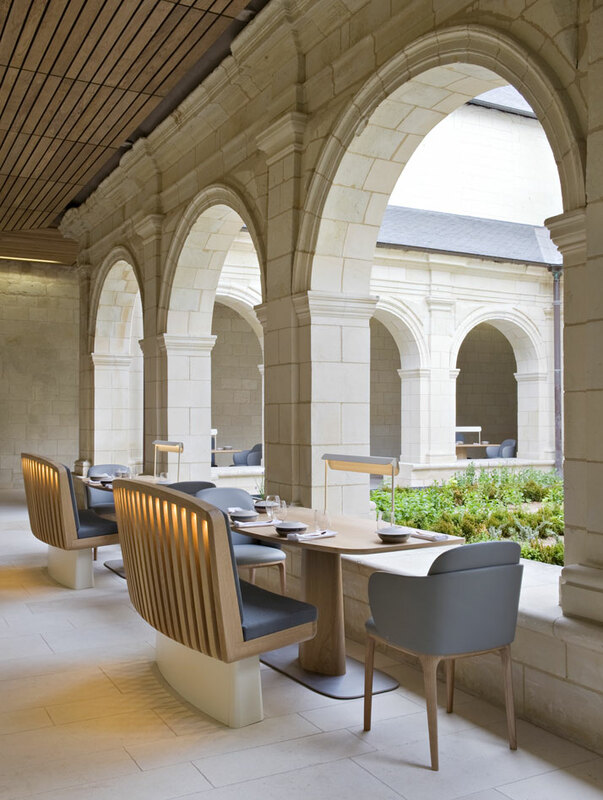 We especially liked the ‘lovers’ seat’ as designer Patrick Jouin calls it, in the breakfast area of the restaurant which sits alongside the courtyard. 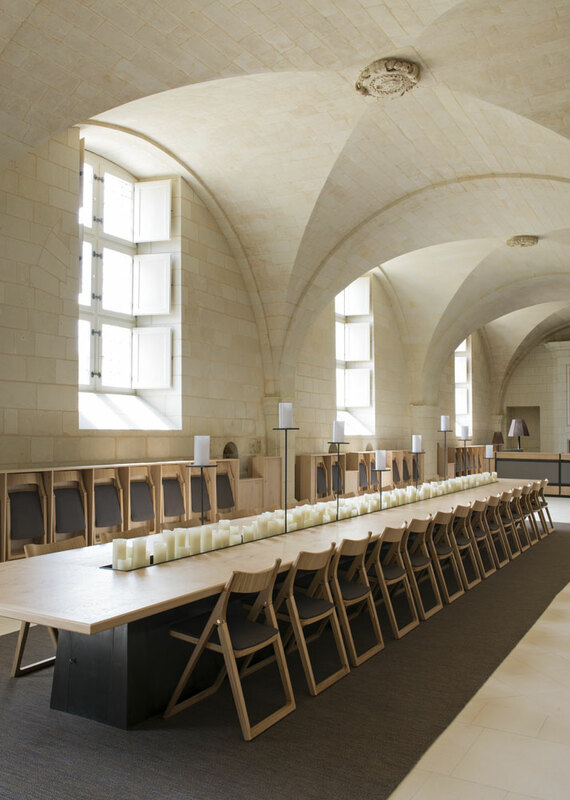 The diversity offered throughout the Abbey complex and the rich atmosphere inside its walls makes up an intangible but large part of the experience. 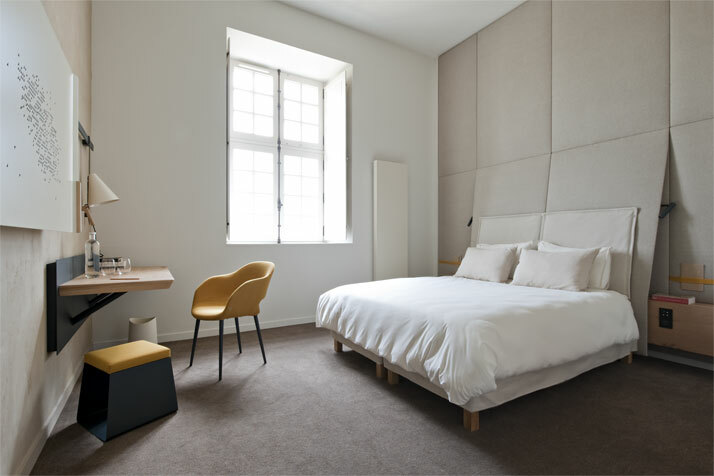 In the hotel and restaurant, the designers’ soothing and homely design succeeds in accentuating the original features and soul of the historic landmark in style and comfort, making it one of the highlights of our stay.